Gigabyte today announced AORUS RTX 2070 Gaming Box, the world’s 1st external graphics solution with real-time ray tracing and AI. 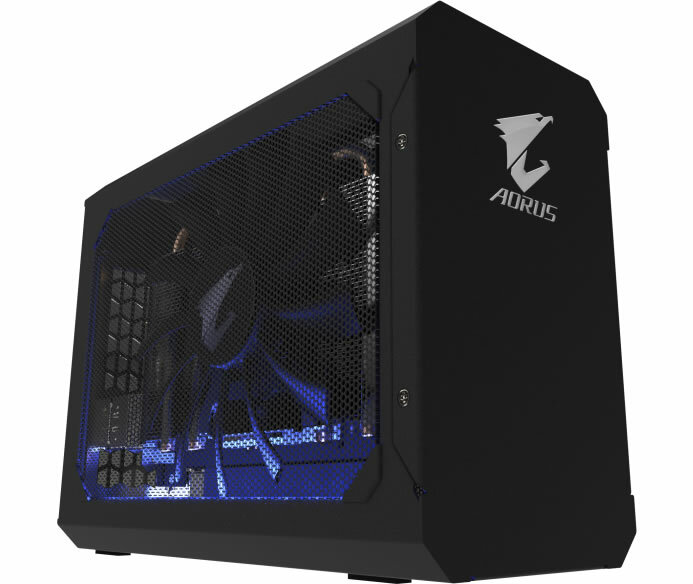 The Gigabyte AORUS RTX 2070 Gaming Box is a graphics powerhouse with a GeForce RTX 2070 graphics card and a 450W PSU installed inside, requiring no extra hassle or cost to put together an accommodating graphics card separately. The GPU is cooled by a customized 130mm large fan, ensuring superior thermal performance and quiet operation. Thanks to the Thunderbolt connectivity, the device is able to provide a significant graphics boost to laptops at a blazing-fast data transfer speed of 40Gbps. The Thunderbolt plug-and-play support also allows for quick, easy connections without having to reboot the PC. The Gaming Box can also charge the connected laptop with the maximum of 100W of power at the same time. 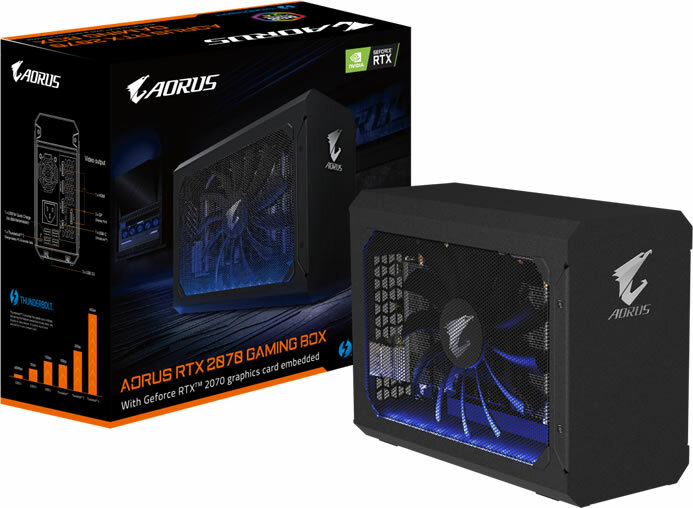 Compared to other external graphics alternatives, the Gigabyte AORUS RTX 2070 Gaming Box can be easily stored or even carried on the go with the carrying bag included with the product, offering better portability. There is customizable lighting powered by RGB Fusion 2.0 illuminating from the inside of the chassis, and it can be synchronized with other AORUS devices. 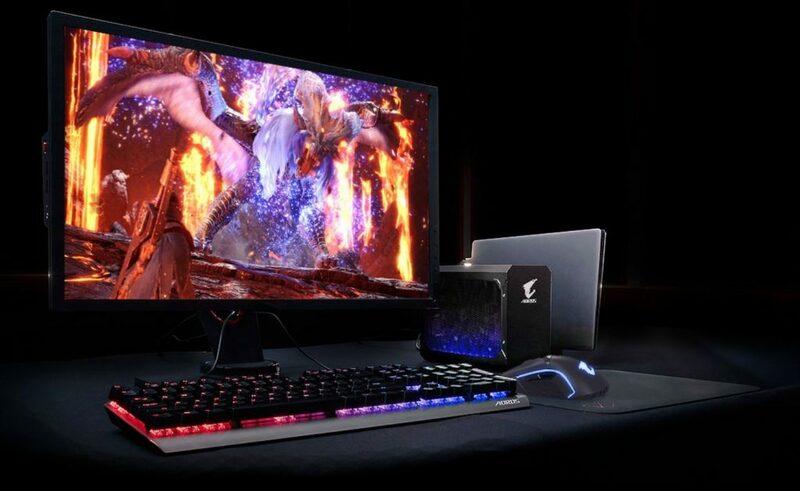 The Gigabyte AORUS RTX 2070 Gaming Box serves as a complete docking station that complements today’s Ultrabook. Aside from 3 sets of DisplayPort, an HDMI, and a USB-C(VirtualLink) outputs to connect up to 4 external monitors simultaneously, the device also has a total of three USB 3.0 ports available at the back for connecting peripherals or external storage for an enhanced user experience. There is also an extra Quick Charge 3.0 port that allows for personal mobile device charging at up to 4 times the speed of a conventional charger.